Review: Frank Booker returns for his second outing on the evergreen Disco Deviance label offering up another pair of glorious disco reinventions seen through a raver's eye. "World Of Make Believe" is a fancy, down the line disco churner with plenty of strings, a hard punch, and a fabulous but of vocal riding over those kick drums; "Sequence Of Movement", instead, is all funky and down on the floor, boasting a sublimely phased out guitar serving as one mighty, groovy, delicious bassline. Yes please Frank. 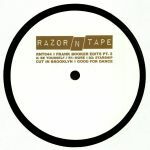 Review: Some six years on from his first edit outing on Razor-N-Tape, Frank Booker returns to the storied Brooklyn imprint with another batch of fire revisions. Leading the charge is the thrillingly low-slung A-side "Be Yourself". This is a driving slab of floor friendly disco that incrementally builds from a spacey, groovy start to a celebratory, string-laden conclusion. Just as good is "More", an elastic disco-funk outing that tightens up and extends a vaguely familiar workout and sounds like the kind of rearrangement that will create pandemonium when dropped at the right time. Finally, Booker dips the tempo considerably on the slo-mo space disco chug of "Starship", perfect for a rooftop boogie. Frank Booker - "Movin' On"
Frank Booker - "It's Time"
Ugly Drums & Chesney - "Soul To Keep"
Ugly Drums & Chesney - "Girls Girls Girls"
Review: Initially released as part of last week's Record Store Day antics, Juno are happy to get our mitts on some of this limited "split grooves" 12" from the always reliable Kolour Ltd. Mr Frank Booker of Hit It Or Quit It fame leads the way with two A Side productions that sit happily between disco and house; loose, funk laden disco is very much the shape of lead track "Movin On" which features some great drum chopping. Complementing this, "It's Time" takes discoid elements and applies them to a crunchy mid tempo house template. 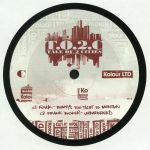 Flip over and rising talent Ugly Drums pairs with Chesney for two soul laden productions, with the dusty Raw Cuts style antics of "Soul To Keep" complemented by the sugary beatdown of "Girls Girls Girls".